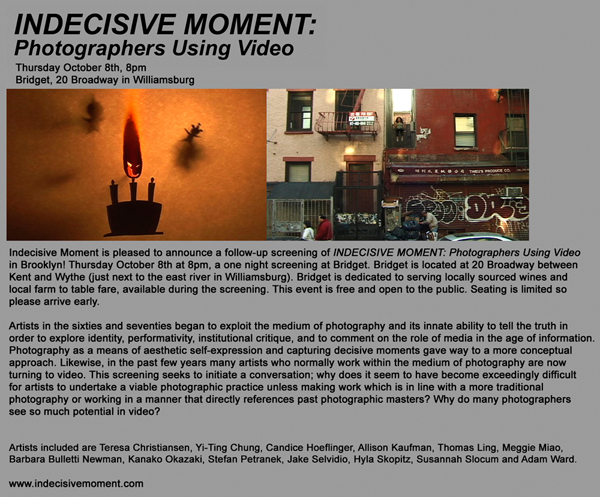 INDECISIVE MOMENT presents So the Day, a screening in collaboration with Pulp Legend. The videos included fall broadly under two correlated themes that are intertwined throughout the program: Identity and Perception. 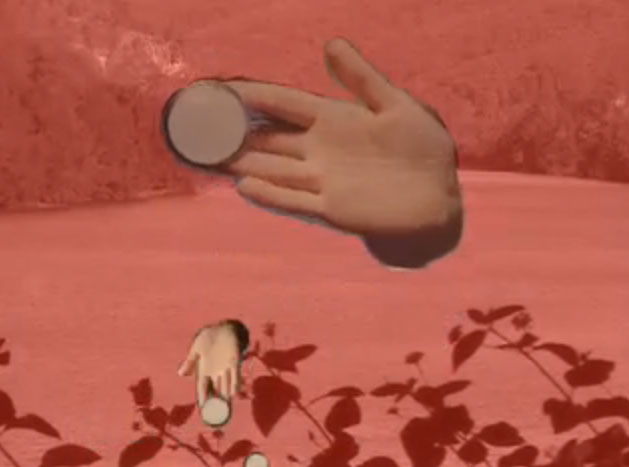 Gender and cultural identity is explored through the trope of role playing when Hello Kitty goes on a date with Mickey Mouse and when a football player sings a progressively more frenetic and distorted version of “I’m Gonna Wash That Man Right Outta My Hair.” Other artists use the camera as a tool with which to create a coded language or a systematic way of perceiving the natural world and reconsidering it. An hd video, which has been processed through a custom patch and then regurgitated as an sd video, tells the story of how a sketch in a notebook triggers a search along the Gowanus where an imagined boat is made real; drawing the world as it seemingly draws itself. These artists, each in their own way, take a meditative stance to image making, employing rhythyms and patterns that distort the mundane. The cummulative effect of the screening acts as a mantra where the relationship between words, images, sounds, and their meaning shifts and transforms. Collective Showing I, a video festival organized by Pulp Legend, is the first project in a series that brings a number of art collectives together in one show. 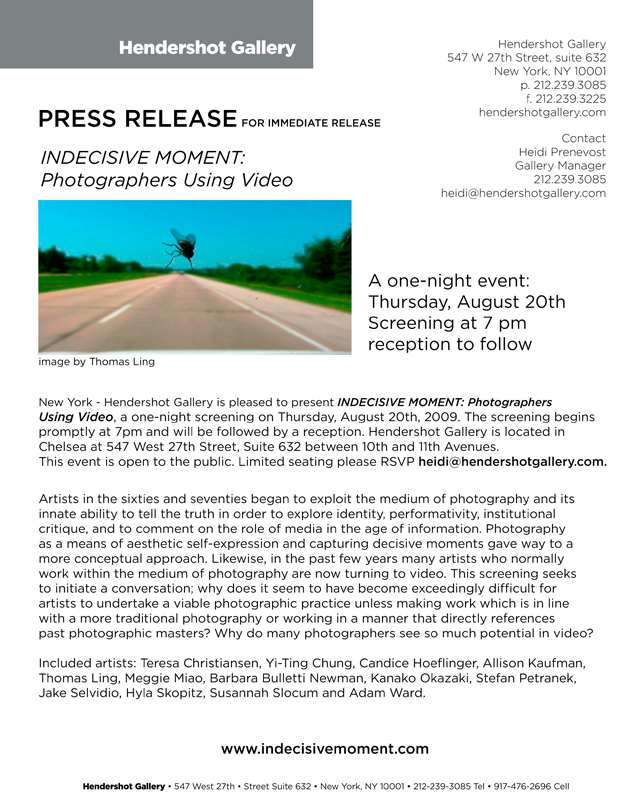 Indecisive Moment has been invited to curate a video screening. Pulp Legend is bringing together a bunch of DIY/ artist-run groups working with video and is asking each to curate an hour long program. We’d love to see what you have been up to. Please send us links to any work(s) that you feel would work for a screening (rather than installation). We are in the preliminary stages and haven’t decided on a definite theme, so just send us whatever you’d like. Please nothing longer than ten minutes. We are always interested in photographers who make videos or videos that are about photography. Please feel free to pass this e-mail onto other video artists and photographers. The show is tentatively planned for mid-September at Brooklyn Fire Proof East so please be in touch as soon as possible. 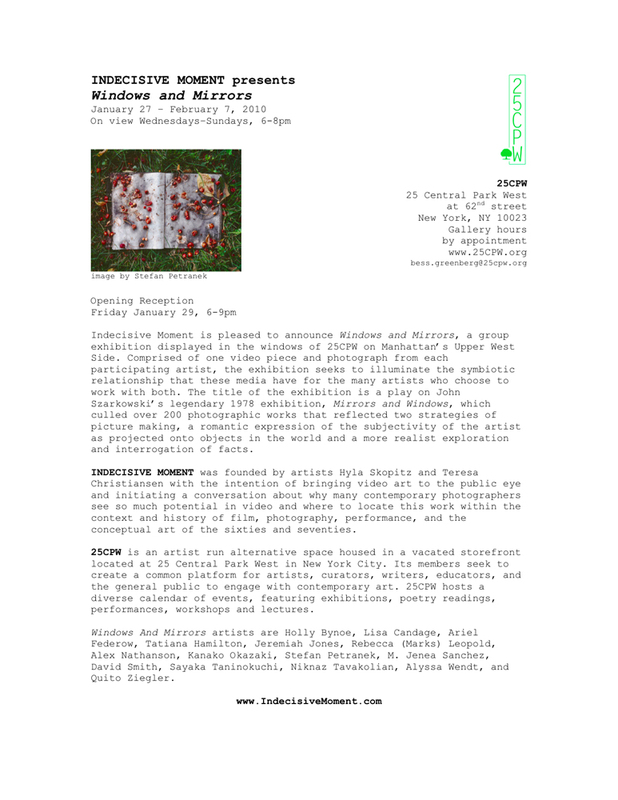 Here are some photos of the installation of the Windows and Mirrors show at 25CPW.